July is one of the most popular months to visit Montreal. Tourists flock to the city to experience great summer events and free attractions the city has to offer this month. While the weather may be hot and humid, July events start early with the International Fireworks Competition and Canada Day celebrations and continue all month long with events like Carifiesta, ComicCon, and the Just for Laughs Comedy Festival. Since July and August are the height of the summer tourist season, you should be prepared for large crowds, especially in the Old Port and Downtown districts of the city around the holidays, on weekends, and during festivals. Also, you should pack breezy, comfortable clothing to help you stay cool in the wet heat of Montreal's summer. Although winter is long and cold and spring is brief and temperate, the summer can get downright sweaty in Montreal, making it harder to enjoy some of the great outdoor events happening in the city. In the daytime, Montreal is hot and humid, which means the average high of 80 F (26.6 C) will feel more like 104 F (40 C), but nights in the city are wet and relatively chilly for the summer with average low temperatures reaching 64 F (18 C). July is also a lot wetter than most people expect, with some sort of precipitation happening most days of the month, including an average of 11 days of moderate or heavy rain and 12 days involving light showers. Since the weather is usually hot and humid, you'll want to avoid anything polyester or constricting and instead opt for lightweight, breathable fabrics and minimal body coverage with your clothing. Also, don't forget to bring a light cardigan or jacket in case you get cold at night. Your packing list should ideally include shorts, linen pants, short-sleeved and sleeveless shirts, tank tops, summer dresses, light cardigans (linen or merino wool for wicking sweat), wraps, light cotton jackets, long pants, closed-toe and open-toe shoes, sandals, sunglasses and sunscreen, an umbrella and raincoat, and a windbreaker for some of the particularly breezy evenings. The most vibrant month of the year, Montreal weather in July is as hot as its event calendar. Every weekend features major festivals, outdoor events, street fairs, and sidewalk sales, and free attractions for tourists and residents of the city alike. Canada Day Celebrations: From a parade honoring Canada's history to a magnificent firework show over the Saint Lawrence River, Montreal celebrates Canada Day on July 1 each year with a variety of events. International Fireworks Competition: On Wednesdays and Saturdays throughout the month, pyrotechnicians from around the world gather at La Ronde to show off their latest firework displays. Carifiesta: A celebration of the rich Carribean cultural heritage of Montreal centered around a downtown parade, Carifiesta is one of the biggest events of its kind in North America. Montreal Jazz Festival: Starting in late June and continuing through the first week of July, this festival was named the largest in the world by Guinness Book of World Records in 2004. Fantasia Film Festival: One of North America's largest genre film festivals including those in the horror, fantasy, Hong Kong action, animation, sci-fi, and B-movie film categories. Just for Laughs Comedy Festival: Taking place most of the month, this celebration of comedy features international stars and newcomer comedians in a series of shows, galas, and free street performances. Locals who aren't out of town on vacation in July come out in droves to make the most of the hottest month of the year, whether it's lingering in Montreal's large parks, on city beaches, or at Montreal's various outdoor festivals and sidewalk sales. Many museums, offices, government buildings, and city attractions are closed on Canada Day, July 1. Hotels and airfare tend to increase in July and August, so book early to avoid last-minute price inflation as rooms sell out. Areas around the Place des Arts and other tourist attractions are often the first to book up accommodations but most of Montreal is accessible by public transit so don't be afraid to book further away from the Downtown and Old Port districts. Using the municipal trains and transit system is a great way to save money and see as much of the city as possible on your trip. 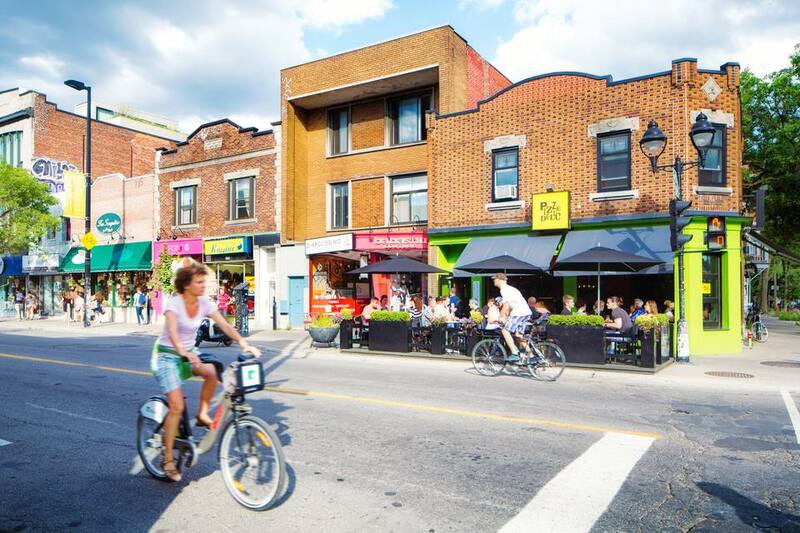 The Le Plateau-Mont-Royal and Quartier des Spectacles neighborhoods are among the best places to stay outside of the downtown district.